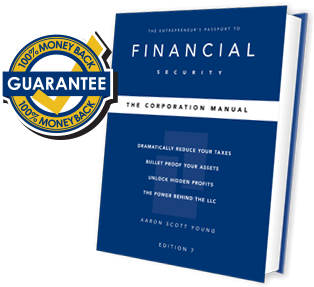 100% MONEY BACK GUARANTEE: Simply return The Corporation Manual with 30 days for your money back. Shipping is not included. Investors, hobbyists, entrepreneurs, employees, as well as business owners can all realize more profits, protection, and privacy from the dynamic strategies presented in The Corporation Manual. Powerful information that is sure to help you start, grow and profit from your business. Order within the next 24 hours and receive access to this amazing on-line resource centre. The Corporation Manual is a comprehensive, easy to follow "how-to" manual that provides valuable information you need to know about running your business. It includes everything from paperwork and estate planning strategies, to choosing the right business entity and lowering your taxes. This book is worth its weight in gold. Just reading this powerful resource guide could save you thousands of dollars in taxes. “If you want to learn how to use your Corporation as a tool for asset protection and tax reduction, then this is the book for you. A practical, easy to understand guide for learning valuable business strategies.” - Scott Burnett, Esq. Less than the price of a consultant and it will be on your shelf ready to give instant counseling from now on.